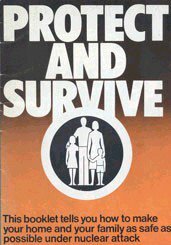 To begin the new year on a cheery note, I'm currently reading about how Britain once planned to respond if attacked by a nuclear weapon. The evidence is all laid out in one of my Christmas presents, 'The Prime Minister - The Office And Its Holders Since 1945' by Peter Hennessy. It's a fascinating book for all sorts of reasons, but the section on what would happen in the event of nuclear war is one of the most striking of all. It was Hennessy, for example, who first uncovered the fact that the way Britain's submarine fleet would "test" to see if the country had been destroyed by a hydrogen bomb would be to see if the Today programme was still being broadcast on Radio 4. If there was no sign of it for a few days, then armageddon had most definitely arrived. The whole subject reminds me of the time when, much younger, I set to drawing a map of how we could build a nuclear bunker in our back garden. Whenever there was a thunderstorm over our town, a routine of grim predictability would be instigated with militaryesque precision by my mum. With a carefully contrived hysteria that merely succeeded in making everything all the more noisy and frantic, me and my sister were to dash downstairs from where we'd been watching the lightning from our respective bedrooms, and each disconnect one of the two TV aerials that were wired into our house - one in the living room, one in the kitchen. Given these were located down the back of awkwardly-sized sideboards, it was naturally the job of us kids, not the parents, to risk electrocution and fiddle insanely with bits of wiring while thunder boomed around outside. We couldn't reconnect the aerials for ages after the storm had obviously ended, in case "it came back". Of course this whole business would always rob what should've been a dramatic meteorological occasion of all excitement, replacing it with drudgery and a feeling of having our enjoyment of the thunder and lightning compromised by archetypal fussy mumsiness. The one time I mounted a half-hearted protest against disconnection, arguing that I really did have to watch this episode of Scooby Doo to its conclusion, my mum retorted by making me stand on the other side of the room a good few yards from the television screen, so while the picture was hopelessly miniscule, "at least I'd be safe from the set blowing up." Anyway, during one particularly bad storm, denied children's programmes for what felt like hours, I decided to pass the time drawing a map of how the family could construct a nuclear fallout shelter in the back garden. This was in the early 1980s, I was still at primary school and through what I'd picked up on the teatime news and idle talk in the playground it was obvious to me the world was teetering on the edge of complete destruction. Fierce-sounding rhetoric emanating from America and the USSR portended a showdown sooner or later, I reckoned; I'd proudly drawn the route of the Iron Curtain on the tatty map of the world that was pinned to my bedroom wall. Well, if we were all going to go sometime soon, it was best to appear knowledgeable about from which direction the bombs would be launched. Besides, although we lived in a moderately-sized town, there was a university on our doorstep: an obvious target. It took me most of a weekend to complete the plan, which I painstakingly drew to scale after going out and pacing around our small garden measuring out dimensions and distances. I decided the fall-out complex - for this was to be no mere single room - could be accessed via a small service lift akin to the kind I'd seen once on a visit to my dad's work. A lift somehow seemed more appropriate than a flight of stairs, even though the latter was, in retrospect, more sensible: if the sirens went off, we'd only get to use the lift once before the surface world was destroyed. The shelter would naturally just be for the four of us. The neighbours could fend for themselves; they should've built their own shelters, like I'd done. Besides calculating just how deep I reckoned we'd have to dig before we were safe, I made sure there were rooms allocated to store provisions, house the generator, and above all somewhere to put the piano which dad had inherited from some distant relation and which at the time I was learning to play. Then, once the drawings were all finished, I pointedly put them up on my bedroom wall where someone passing the door might be able to see them. Forget watching Hanna-Barbera cartoons on a screen the size of a matchbox; this was a gesture intended to say look what I'd done to safeguard our family's future. Inevitably nobody took the blind bit of notice, and I was, to be honest, too timid to parade my achievements in front of their faces, or anybody at school. Nonetheless I took content from the fact that when the balloon went up, I'd been the one who'd thought beyond simply propping a few doors up against a wall and grabbing the nearest can of beans. I lost the drawings a long time ago. I most likely threw them away when I got older and decided what a naïve and stupid kid I'd been. And anyway, I later discovered there was too much clay in the soil of my parents' garden to barely dig a big enough hole to bury my sister's guinea pigs.